The National Gallery Singapore won two awards at the Singapore Tourism Awards 2016. The awards are Best Attraction Experience and Breakthrough Contribution to Tourism. The gallery was first open to the public in November 2015, which makes the wins all the more remarkable. The gallery is a “visual arts institution (with) the largest public collection of modern art in Singapore and Southeast Asia”. Since the National Gallery Singapore is housed in two restored national monuments, City Hall and Supreme Court, visitors will have a sense of the rich heritage represented by the gallery’s interior. Moreover, the building facade has a distinctive architectural design that blends historical and contemporary elements. See the image above, which shows how the National Gallery Singapore building facade can become an interesting backdrop for events and activities. 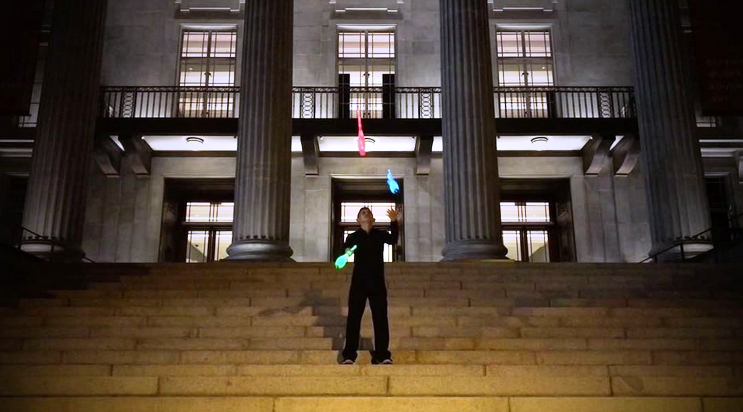 A prominent street photographer in Singapore recorded an “animated photograph” of JimmyJuggler, as seen in the still image above. On the whole, the gallery is an interesting venue to hold an event; read more about renting a space for events at the gallery.